The World Cup starts June 11th and the sports betting operators should be working hard to get their portals in the best shape possible! There are some that have some work to do to get there. 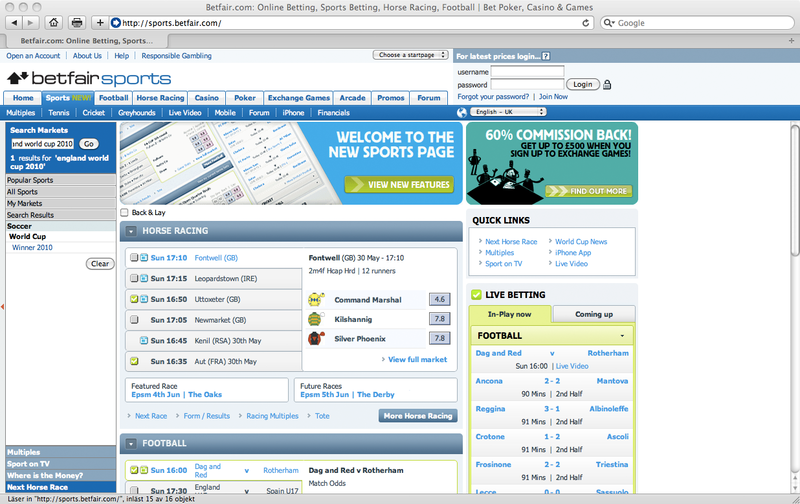 Today I tried to search for bets on 8 different betting portals (Betfair, Betsafe, bwin (this used to be linked bwin.com but they asked me to remove the link), NordicBet, PaddyPower, PartyBets (this used to be linked partybets.com but bwin.party asked me to remove the link), Unibet and William Hill (link asked to be removed by William Hill)) and the results weren’t that good! A good search function can be the difference between a placed bet and a lost customer. I searched “England World Cup 2010” on all the portals and if I should give them a grade (1 – 5, where 5 is the best) based on relevant search results. My goal was to place a bet on England in the World Cup. Both bwin and NordicBet returned relevant bets. Betfair returned only one bet. PaddyPower and Unibet returned more top results bets from other events than the World Cup. Betsafe, PartyBets and Unibet didn’t return any bets at all. Search is just one of many different areas I will cover in my upcoming Sportsbook Study. The Sportsbook Study will be done during the summer and will probably be done in September or October. Do you want your sportsbook to be part of the study? Then get in touch with me! Below you see the different operators search result when searching for “England World Cup 2010”. Image 1. A search at Betfair reutrns one bet. 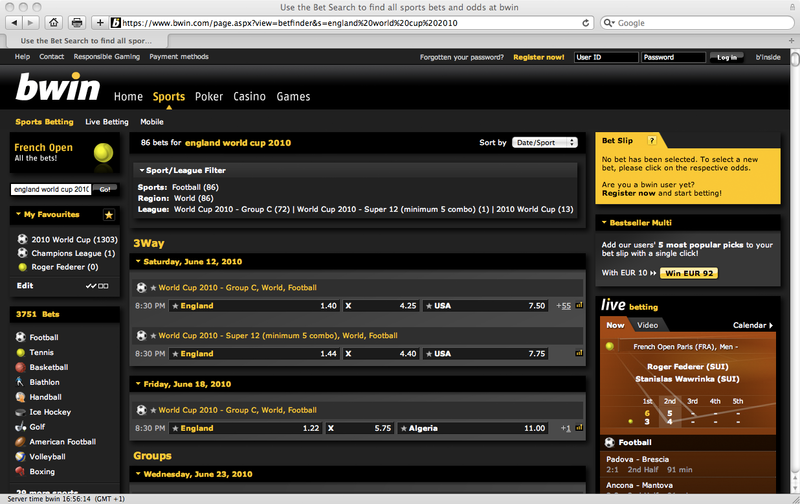 The search at Betfair.com returns one result, “Winner 2010”, where you can place a bet on who will win the World Cup. But there are many more bets on England you can play on during the World Cup. Image 2. A search on Betsafe doesn’t return any bets. Betsafe’s search doesn’t work very well. It returns no bets even though there are plenty of bets you can play. Image 3. A search on bwin gives you a good result. bwin does a good job. Their search returns bets associated with the World Cup. Image 4. 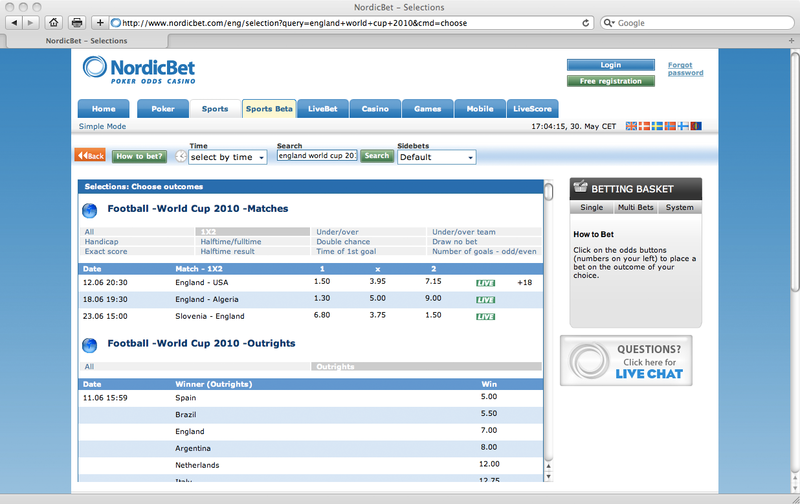 NordicBet’s search works very well. NordicBet does a good job. Their search returns bets associated with the World Cup. Image 5. A search at PaddyPower returns bets from other events first. 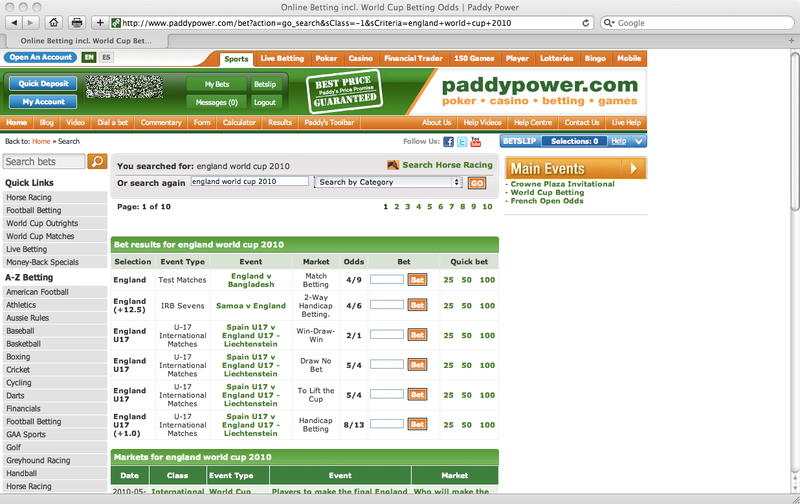 PaddyPower’s search returns too many bets not related to the World Cup. It would be ok if the bets were presented below bets related to the World Cup. Image 6. 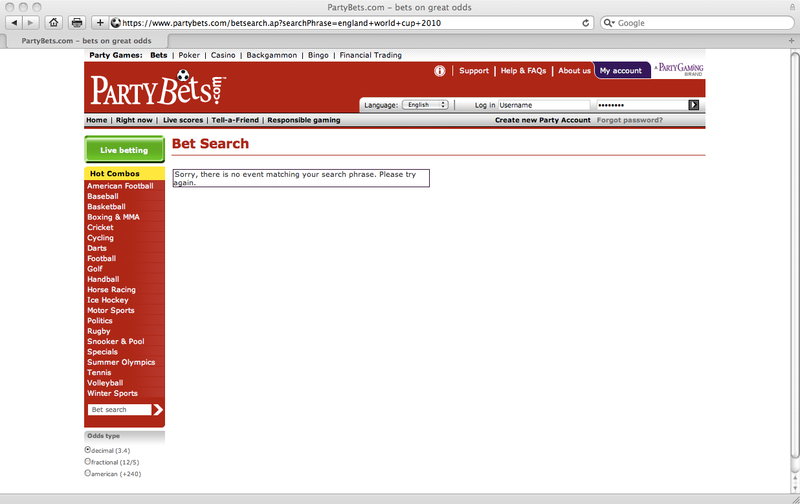 A search at PartyBets doesn’t find any bets. PartyBets (this used to be linked partybets.com but bwin.party asked me to remove the link) didn’t return any results and it took me a while to find any bets related to the World Cup, but they were there. Just hard to find. Image 7. 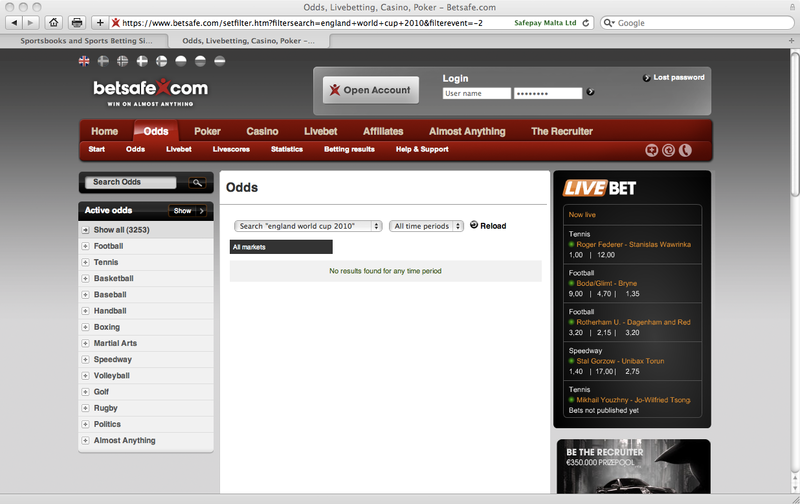 A search at Unibet returns bets from other events first. 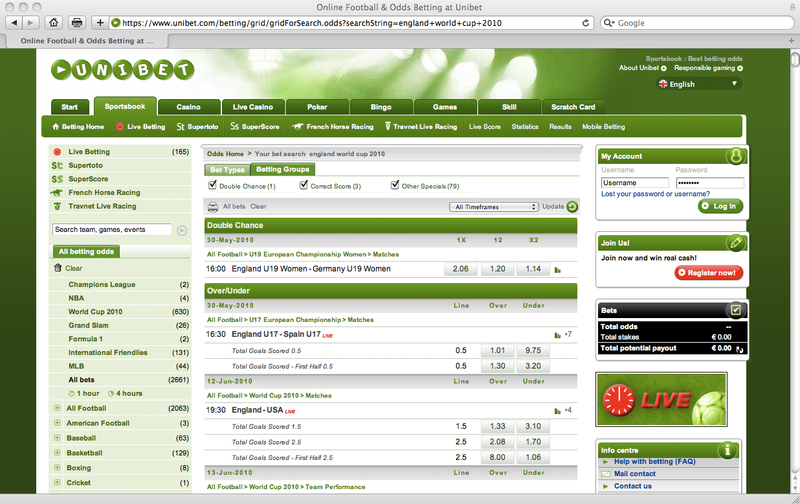 Unibet returns non World Cup bets first. Image 8. A search at William Hill doesn’t return any bets. 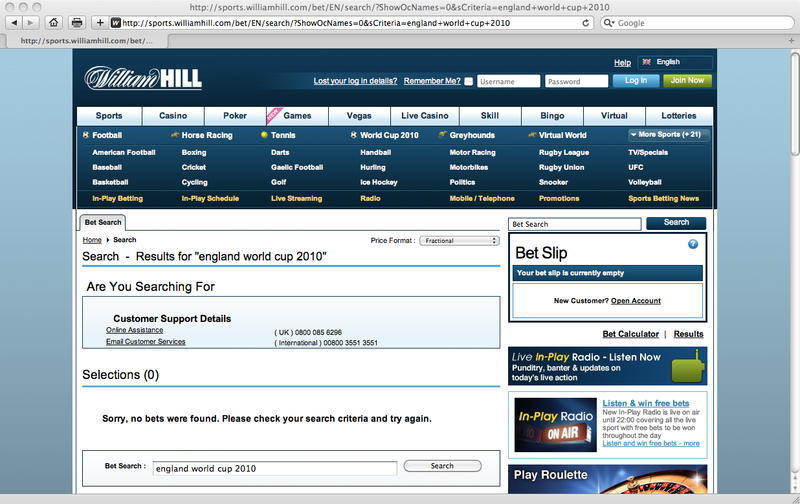 William Hill’s search doesn’t work very well. It returns no bets even though there are plenty of bets you can play.